We last left our heroes ground zero at an inferno. An attack by Locus trying to stop them from destroying the machine proves J’onn’s innocence and the Justice League ends up in Locus’ homebase. 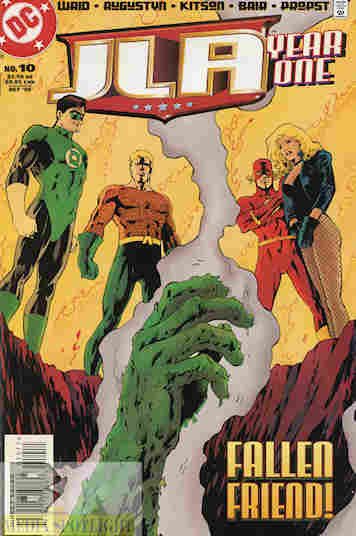 However, it’s not the League that stops Locus as their new bodies give out when J’onn tries to probe them and they die. Back at League HQ the heroes reveal their true identities to each other, hoping to break the last bit of paranoia between the quintet. Also, Green Lantern has accepted that Flash is the considered leader of the League. Then they find a beaten Snapper, who warns them about his uncle…and the impending Appellaxian invasion! What they got right: There is so much that works in this story. J’onn is properly cleared. The scene with the heroes revealing their identities to each other has the proper impact and is earned. Hal shows relief in not being the leader because he thought he was screwing up and accepts Flash is better at it, further proven when Barry is the first one to remove his mask. The final fight with Locus is also really good, allowing everyone their moment and still highlighting the remaining trust issues between the team even as Green Lantern show his acceptance and relief that he isn’t the leader. Every moment is hit properly from the burning sky right down to the reveal of the invasion. Also, Hal stopping the continents from reforming into Pangaea with his ring is a beautiful moment. What they got wrong: Of course, using a photograph of Earth is cheating a bit. It’s been done before and makes it easier to ensure it looks right as Earth, but it looks off when the moon and the rest of space, as well as Green Lantern, are regular drawings. Recommendation: Probably the best issue thus far and there are still two more to go in this maxi-series. Worth picking up. Posted by ShadowWing Tronix on December 31, 2018 in DC Spotlight, Yesterday's Comics and tagged Aquaman, Barry Allen, Black Canary, DC Comics, DC Universe, Dinah Lance, J'onn J'onzz, John Jones, Justice League Of America, Martian Manhunter, Snapper Car, The Flash.